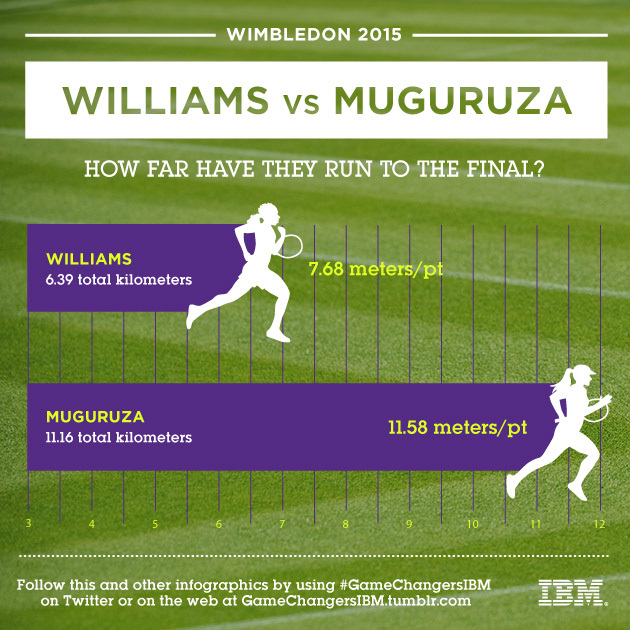 How much distance have Serena Williams and Garbine Muguruza covered on court in their matches leading up to the 2015 Wimbledon final? Serena Williams and Garbine Muguruza will face off in the Wimbledon 2015 final match on Saturday. No. 1 Serena beat Margarita Gasparyan, Timea Babos, Heather Watson, Venus Williams, Victoria Azarenka and Maria Sharapova en route to the final. No. 20 Muguruza beat Varvara Lepchenko, Mirjana Lucic-Baroni, Angelique Kerber, Caroline Wozniacki, Timea Bacsinszky and Agniezska Radwanska en route to the final. All in all, it’s a long way to run to the Wimbledon title match. Serena and Muguruza have both done it a little bit differently to get there. Who will come out on top as the 2015 champion?